Good luck linking your turns. Located at the top of Palmyra Peak (you take the Revelation Lift and hike up), Senior's is, well, very steep. It's so steep the folks in this video don't look like they're having a good time skiing. It's the kind of run where ugly jump turns are the rule and not the exception. Please watch this video in which our very cautious cameraman (Good for him! Safety first!) gets some really good shots of other skiers whizzing down one of the steepest runs in North America, but doesn't do a great job of selling how gnarly the run is. He didn't need a GoPro for this, is what I'm saying. This area is apparently referred to as the "no fall zone," and I can certainly see why. I wouldn't want to fall there. Props to the ski patroller in that video for referring to the Lake Chutes as "pretty rowdy terrain," like it's a ski run that threw a frat party. The other six runs listed are Christmas Chute at Alyeska (Alaska), Corbet's Couloir at Jackson Hole (Wyoming), The Goat at Stowe Mountain (Vermont), Paradise at Mad River Glen (Vermont), Great Scott at Snowbird (Utah), and Kill The Banker at Revelstoke Mountain (British Columbia). Featured image depicts the stairway to heaven, Gold Hill Stars, which leads to Palmyra Peak where Senior's can be found. Not a fan of the lift lines at ski resorts? 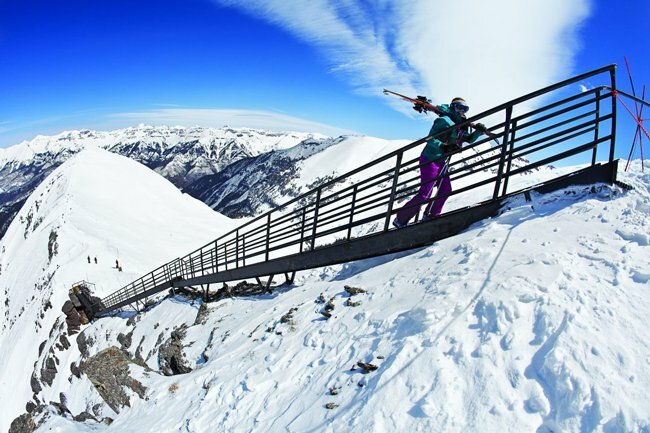 Check out these 7 hidden gem ski areas!